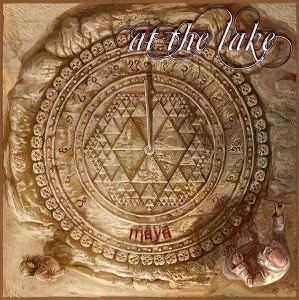 Polish band "At the lake" are back with this new album - Maya. It's one of those albums that straddles multiple genres - symphonic metal and gothic metal primarily, but with folk and classical influences too. "Tomorrow I will fly" opens with some lovely violin work before the drums join in with a deep pounding rhythm, and the background vocals add a beautiful sound - it's more an instrumental track than a proper song as the vocals are not singing lyrics but are instead being used more as instruments and very effectively too. As good as that first track is, the rest of the album steps things up to another level as Natalia lets loose her excellent voice in the proper songs. "Forget" is a particularly strong track, but really the whole album is excellent. "Spring of forgiveness" is another stand-out track with a strong melody and vocals - possibly my favourite song on the album, but then again every time I listen to the album I change my mind about what song I like most. The album includes a cover of the Rammstein classic "Sonne" which I was a litte wary of listening to as I couldnt imagine the band covering it, but they do a superb job with one of the male members taking over the main vocal duties - a really good version. I don't know how they do it, but Ravenheart music seem to have a knack of finding bands that are almost unknown in the UK but who are extremely talented, and this is definitely another of those - a band that deserve to be far bigger based on the extremely high quality of the music. This is a great album that all fans of female fronted metal, particularly gothic or symphonic metal, should check out - highly recommended.